Hooked on Needles: Machine Quilting Technique - definitely needs some work! Machine Quilting Technique - definitely needs some work! Over the years, I have gone on buying kicks for certain things, just like many of you have done as well. For a while, I was on the hunt for fabric panels to make things like vests, baby quilts, aprons, or doll clothing and accessories. Recently I showed you what I did to use up two of the vest panels in a way that I am sure the designer did not intend. Today I have another panel to show you, but this one was finished in the way it was originally intended. It's a Country Cabin Doll Quilt, and I used this project to practice my machine quilting technique. As you can see by the machine stitching lines on this portion of the quilt, my technique needs a little help! I love using the walking foot and being able to whip up a little project like this so quickly. 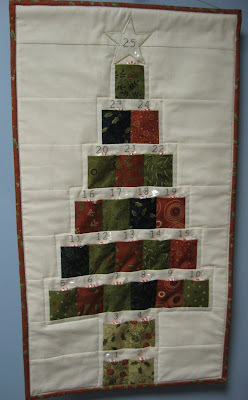 But I really wish the result looked a little more like I had hand quilted it. Not too bad, but as you can see, not quite perfect either! Looking at the back side of the project, there is no question that I still need a lot of practice! But after I turned the edges of the backing over to the front and machine stitched them to finish the quilt, it really doesn't look all that bad. I am sure some little doll will spend many cozy nights tucked into her little bed with this cozy quilt to keep her warm. I have another panel exactly like this one which I am in the process of finishing right now, and two matching pillow squares with the little cabin design on them which I will make into little pillows to go with the quilts. These will be donated to the yard sale which is being held next weekend to raise money for our local high school marching band, of which my older daughter has been a member for the past 4 years. I am still slowly going through all the unfinished projects I found when I did my big sewing room clean-up at the beginning of the year. It will be nice to have these little quilts finished and given away to a worthy cause instead of sitting in my unfinished pile for another year. 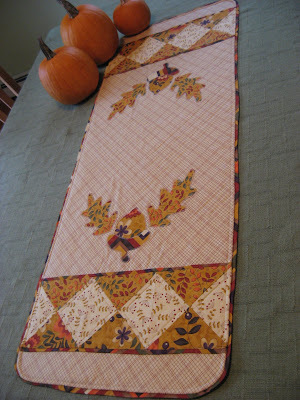 Do you finish your quilts by hand or by machine? I would love to hear any advice or tips on how to perfect my technique using my walking foot on my old Singer. Don't be shy! Go ahead and leave a comment and share your wisdom. I would really appreciate it!